As if Brisbane wasn’t pretty enough already, a bunch of talented street artists went and made it even prettier with their creative masterpieces. From Fortitude Valley, through to New Farm and out to South Brisbane, Brisbane is covered in glorious street art that makes us swoon. 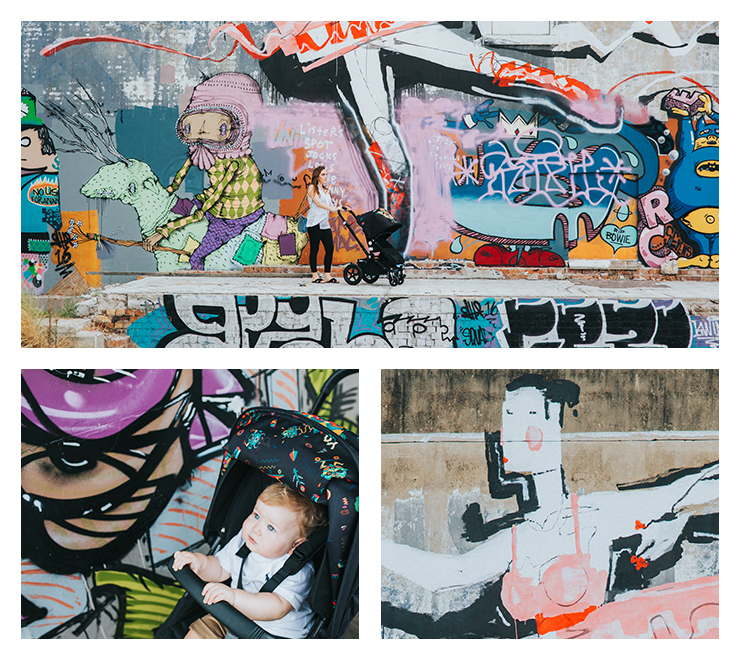 In celebration of all that art, Bugaboo have partnered up with Niark1, a French graphic designer, illustrator and artist who creates ah-mazing surreal and psychedelic artworks, who has created some incredible canopies for their strollers. Babies are so cool these days. To get in the spirit we’ve scoured the streets to bring you some of Brisbane’s best street art, so open Google Maps, plan the perfect route and seek out some eye candy, stat! Fish Lane is such an exciting corner of Brisbane. Not only is it packed full of hidden bars and exciting restaurants but it plays canvas to a bunch of unique and edgy pieces of street art. Come with an empty stomach, and plenty of storage left on your phone because this the perfect spot to view street art. You'll find work by local legends, Frank & Mimi, and dozens of up and comers you haven't heard of yet, but will fall in love instantly. When we mention a cool, cutting edge, modern spot decked out with street art what comes to mind? Probably not a toilet foyer. But, that’s exactly where you can find another installment of Frank & Mimi’s work at the Brisbane Powerhouse. Who knew the bathrooms would be the most exciting part of a venue? The powerhouse is also covered in a whole heap of graffiti, so get your explore on! Coniston Lane’s street art gives us serious Melbourne vibes and reminds us that Brisbane is serving up spades of cool (possibly even more than our southern counterparts). Multiple artists have experimented in this spot, but you will mostly recognise Instagus' work. Guido Van Helton unleashed his creative energy on Trafalgar Street in a huge way. This piece spans multiple stories and catches your eye with its poignant and thought provoking connotations. This piece is a gem we have Brisbane Street Art Festival to thank for, too. 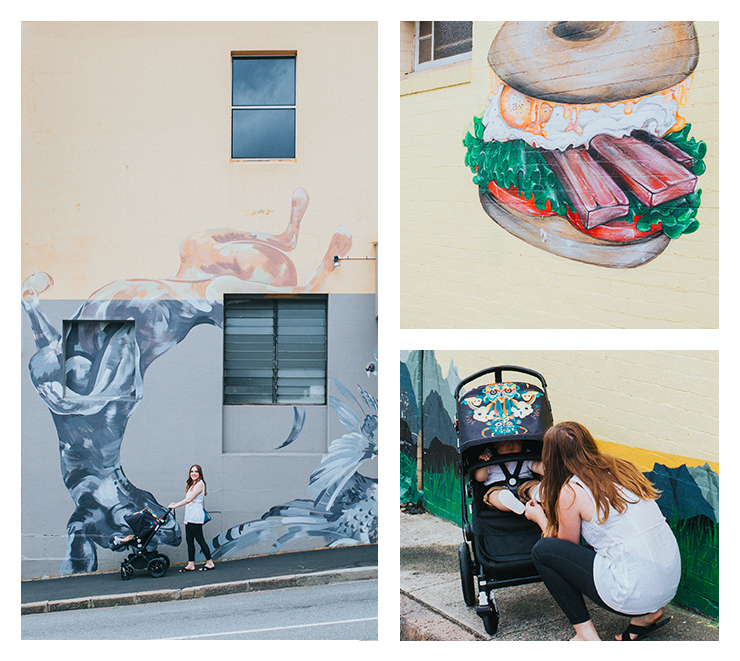 Fresh, zesty Vietnamese street food, outdoor seating, sunshine eating, and a huge Muhammad Ali mural make Hello Please the perfect spot to soak in Brisbane’s finest street art. The mural is pretty impressive—it spans three stories, after all—and makes for the perfect injection of street cred. Plus, it makes a pretty cool background for your #Foodstagram. We won't blame if you visit just to check out the street art, though. Fortitude Valley’s Bloodhound Bar is blanketed in street art. Their Robertson Street facing walls are adorned with the work of street art legends Frank & Mimi. As if this piece of art wasn’t enough, their other outer wall is home to a huge, collaborative mural from the 2016 Brisbane Street Art Festival featuring Frank & Mimi again, plus the mega-talented Anthony Lister. The upstairs balcon is decked out in abstract, super colourful pieces while their street facing walls are covered in playful pups care of Frank & Mimi, and beautiful ballerinas (thanks, Lister!) If you're looking for Brisbane street art, this is your spot! Scout Cafe’s adorable bagel street art is an ode to their next-level good bagels. Seriously—try their bagels, people! The mural changes often, so be sure to check out this delicious iteration before it's gone, and gets turned into something new (which we're sure will be just as beautiful!). Not only does this piece look delicious, it's also super cool and features a sprawling mountain scape, oodles of vibrant colours, and of course, a next-level bagel. Jamie’s Espresso is home to a pretty impressive mural by Mik Sheda out the back to admire while you get your daily caffeine fix. Jamie’s used to be home to whole lot more street art, which has unfortunately been covered up—but rumour has it there may be more to come! Regardless, there is still plenty of street art site seeing to be had here. Now you can stop by to admire the uber-quirky piece by Mik Sheda that reads "the quick brown fox". It's huge, too: it scales across two floors of multiple buildings! Chur Burger is a total hub for street art viewing. Nestled down a laneway, under the Tryp Hotel, your eyes and taste buds will love you forever after an adventure to Chur Burger. There's so much colour, the street art here will make you feel like you're in a gallery! This spot gives us serious Melbourne vibes, with laneways bursting full of vibrantly coloured street art pieces. Editor’s note: This article is proudly sponsored by Bugaboo and endorsed by The Urban List. Thank you for supporting the sponsors who make The Urban List possible. Click here for more information on our editorial policy.